Of course, to truly mimic the game that is played out nationally with much higher stakes, I would not merely deny the existence of the sack of flour, but rather dismiss those pointing out it is there by suggesting they merely have a "liberal agenda." This is perhaps nowhere more frequently confronted than in the academy. Google "professor" and "liberal" and you'll get 12.4 million hits (not an exaggeration) about how professors are liberal, why they are liberal, how universities don't have diversity because they don't have diversity of thought (because diversity of thought can best be gauged by whether one identifies as "liberal" or "conservative"), or about how professors "indoctrinate" students. 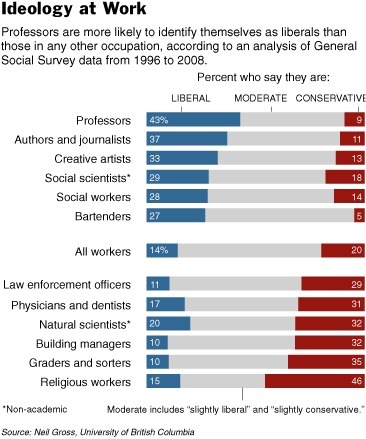 While it's true that the plurality of the professoriate identify as liberal, it's hardly overrun. About 43 percent of professors identify as liberal, which is certainly more than in the public at large, but hardly the 98 percent you would expect hearing the rhetoric of the academy's harshest critics. The latest study on why professors end up liberal came to a pretty boring conclusion: because most graduate students studying to be professors are. The authors of the study then examine why that is the case, and ultimately conclude that most recent college graduates are more liberal, and that essentially, like we all do in so many other areas of life, those flirting with an academic life do so because they are already predisposed to the sorts of attitudes for which the university is stereotypically known. As Neil Gross, an author of the study, pointed out to The New York Times, "The irony is that the more conservatives complain about academia’s liberalism, the more likely it’s going to remain a bastion of liberalism." The study found that discrimination in hiring, however -- the charge most often leveled by those on the Right complaining about the left-leaning academy -- was not a factor. naturally at odds with conservative ideology" (the study also considers plausible previous theories that professors tend to be less religious and thus less conservative, and less materialistic, and thus less drawn to the wealth-oriented policies of the Republican Party). Though it is convincing, especially in my own experience, that future faculty self-select a profession that will match them politically, I also think Ladd and Lipset had a point. Along these lines, though they use it as a point of departure, Gross' study also mentions the idea that the Enlightenment culture of the university can explain these political leanings, a culture whose main goal is to "call into question people's otherwise taken for granted views of the social and political world." Here is where I think much of the grousing about the academy comes into play. As noted in a recent column about politics and the humanities in the Chronicle of Higher Education, much of the critical thought and analysis in which academics engage amounts to a "general challenge to ideological thinking." The Left has plenty of ideological narratives, to be sure. But they are not nearly as systematic and disseminated en masse as those on the Right, and since the academy naturally operates at odds with ideology (indeed, the harshest and most searing accusation a critic can make is that a scholar has come to a conclusion based on ideology rather than evidence), it puts the academy also at odds with conservatives. This does not have to be the case, but it often is. Conservative David Brooks at The New York Times, for example -- a columnist with whom I rarely agree -- has noted again and again how the "educated class" accepts certain things as factually correct, and in response, some on the Right reject it wholesale. Most recently, he echoed this refrain with a lament that the leaders on the far Right "do not accept the legitimacy of scholars and intellectual authorities." Indeed, anytime a scholar publishes on something that confronts in any way right-wing orthodoxy, even if only to complicate the narrative as opposed to refute it (although complicating it often does refute it, given its penchant for simplicity), that scholar is dismissed as a "liberal." Read the online reviews of Jill Lepore's Whites of Their Eyes for one example. All Lepore -- a professor of American history -- does in this book is complicate the Tea Party narrative that the "founders would be rolling over in their graves" at the current state of politics. Maybe they would, but a small dose of historical knowledge indicates just how foreign the founders would have considered about anything in our modern culture. On the Biblical front, two professors of the Hebrew Bible recently published a column in the Huffington Post responding to one of their critics, who took issue with their analysis of Leviticus 18's infamous edict against homosexuality in their recent book. The two scholars used a philological approach to glean meaning from the Hebrew word to'ebah, an "offensive thing," to argue that it's a relative term, not an absolutist one. They bristled at their critic dismissing their argument because they were "liberals, with a liberal agenda," and "had twisted the clear meaning of the biblical law to fulfill that agenda" (remember what I said above about the harshest criticism a critic can offer an academic?). To be fair, this critic does not appear to be a conservative and indeed published his review in a largely left-of-center publication, and did not appear to take a position against homosexuality. Rather, he was arguing that we should look for the justification for our rights from Enlightenment ideals rather than from ancient texts. Fair enough. But the accusation rang a bit too familiar to the authors, no doubt. Of course, one could go on with examples from evolutionary science, climate science, geological science (science of about any kind), from history, the humanities, etc. When and if it contradicts or complicates conservative orthodoxy, it is called liberal, and the timeworn lament about the university's supposed liberalism is again trotted out. One of the most amusing places to watch this play out is on the website Conservapedia, which styles itself as an alternative to Wikipedia, which it of course considers (what else?) "liberal." The narrative of professors being good-for-nothings is so pervasive on the site that there's even a entry on what they call "professor values," complete with a list of arrests and/or unethical behavior by faculty, no matter how obscure, to prove how inherently evil they are. On Conservapedia, everything from the Jesus Seminar to the teaching of Catullus' poetry is part of a "liberal agenda." The Jesus Seminar entry is especially entertaining, in that they put "scholarly consensus" in quotes, as though this is some sort of sham terminology invented solely for vexing conservative Christians (it's not). If Conservapedia seems like a fringe example I'm unfairly citing for its outlandishness, consider Fox News' recent war on SpongeBob SquarePants for pushing an "over-the-top," liberal "agenda," based on the "disputed theory" of climate change, which the hosts say is "unproven science." Of course, climate change caused by man-made activities is not a scientific controversy, just a political one, no matter how many minority researchers the Right cites to justify this narrative. was pointed out by the New York Times to Focus that they had confused the two groups, the organization "stood by its accusation."